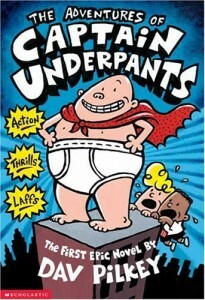 In 2012, Captain Underpants topped the American Library Association’s most frequently banned book list for its “unsuitable” content. It popped again as the #1 most banned book in 2013 for offensive language and violence. In light of the numerous challenges that his popular children’s series has faced, creator Dav Pilkey recently contributed an editorial piece to The Guardian to bring awareness to censorship as well as to celebrating everyone’s right to read. Although my books have been deemed “anti-authoritarian” and “inappropriate” by some, I’ve heard from parents, teachers, and kids alike that they’ve helped turn non-readers into readers. I’ve even had kids tell me they’ve “graduated” from reading my books to longer and more complex stories, whether it’s Harry Potter or the Hunger Games. For me, I’d rather focus on that than on the handful of challengers. All that’s required is a simple change. Instead of saying ‘I don’t think children should read this book,’ just add a single word: ‘I don’t think my children should read this book’… When it comes to books, we may not all agree on what makes for a good read — but I hope we can agree that letting children choose their own books is crucial to helping them learn to love reading… While changing ourselves we can still allow everyone the freedoms they deserve.